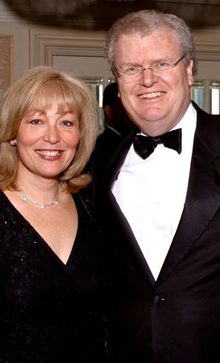 TOKYO, March 9, 2005 — In 1997, the year Sir Howard Stringer joined the Sony Corporation, Japan's premium electronics company, it took little notice of the Samsung Electronics Company, a South Korean television maker fighting a life-or-death battle to survive the Asian currency crisis. Less than a decade later, Samsung now has twice the market capitalization of Sony, which this week named Sir Howard its chairman. Nor is Samsung Sony's only rival. Apple now dominates the market for portable music players. Silicon Valley companies have led the way in digital gadgets like hand-held personal organizers and digital video recorders. Sony is even facing strong competition from Kodak and Canon for digital cameras, a product category it invented. Samsung has become what Sony could once claim - the competitor with both the breadth of products and the appeal of a premium brand. This rapid reversal of fortunes illustrates the highly competitive world of consumer electronics that Sir Howard, a media man, is entering. Complacency and coasting on best-selling products have contributed to a nearly 75 percent decline in Sony's stock value since its March 1, 2000, peak. The invincible "factory of ideas" founded almost six decades ago by Akio Morita, the company that brought the world the transistor radio, the Walkman and the Trinitron television tube, seems to have lost its way. "Samsung is now the anti-Sony," George Gilder, an American technology analyst, said here Wednesday. "Sony is layered with bureaucracy. The amazing thing about Samsung is that it is like Apple with Steve Jobs involved in designing the iPod, it is like Sony with Morita deeply involved in developing products." Samsung has kept a lean corporate structure, with authority increasingly delegated to front-line managers around the world, and almost a quarter of the far-flung staff of 88,000 dedicated to research and development. But in Monday's boardroom purge, Sony demoted the one engineer credited with developing a new, world-beating product line, the PlayStation game consoles. 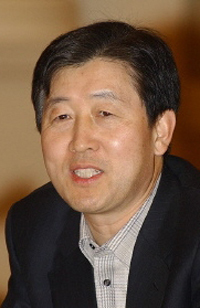 Ken Kutaragi remains chief executive of Sony Computer Entertainment, but he loses supervision of Sony's consumer electronics and semiconductor business just as it is preparing the Cell Chip, a superchip that is to run the next generation of game machines and also high-definition televisions. With the hand-held PlayStation Portable selling like hotcakes since it was released here in December, the next PlayStation is to come out next year, in time to compete with a new Xbox console by the Microsoft Corporation and a new console by Nintendo. In the last three years, Sony's electronics division has dragged down company profits. With the division forecasting losses for 2004, Sony is expecting about $1 billion in profits for the year ending this month, about 1.5 percent of revenue of about $69 billion. By contrast, Samsung, in the year that ended in December, had $10 billion in net income on sales of $56 billion. High profits allow Samsung to invest billions in research and development, maintaining 15 laboratory complexes around the world. "Last year we spent $7 billion in capital spending, the largest for any information technology company in the world," Chu Woo Sik, a spokesman for Samsung Electronics, said by telephone from Seoul. This year, Samsung Electronics, the world's largest maker of memory chips, will invest $10 billion. Samsung also has a huge capacity to build raw components like memory chips and display panels. This investment has given Samsung some of the lowest production costs for items like flat-screen televisions, DVD players and cellphones. Efficient production of flat screens is crucial in a market where oversupply last fall led prices to drop by more than a third. Low cost, stylish design and advanced technology are crucial in a world where the number of producers of DVD drives has jumped to more than 20, from 7 in 2003. 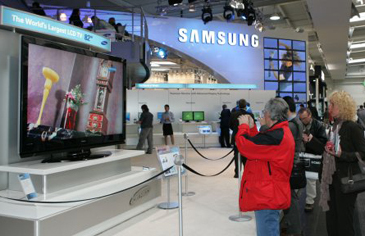 Samsung was once a back-of-the-store brand with bulky televisions and boom boxes. After the Asian currency crisis, Samsung upgraded its product lines to compete directly with Sony for the premium market, leaving cheaper electronic goods to new companies in China. After spending $3 billion a year in advertising, including extensive Olympics sponsorships, Samsung's $12.6 billion brand value now rivals Sony's, according to Interbrand, the brand consultancy. Mr. Choi Ji-Sung, president & CEO of Samsung Electronics Company, answers questions from local journalists in a recent press conference held in Seou, Korea. Samsung is such a leader in flat screens that Sony swallowed its pride last year and joined Samsung in building a huge factory in Korea. With the price of LCD panels quite volatile, executives of both companies said the deal helped reduce the risk. Jim Sanduski, the vice president for marketing of Samsung's television group in the United States, said that locking Sony into the deal was better than trying to sell excess panels on the open market. "We would rather have Sony as a captive customer for 50 percent of the output," he said. "Sony will try to sell the products at a premium price rather than some Chinese brand, say, trying to undercut the market." Sony, for its part, clung too long to its once-innovative Trinitron picture tube technology, and it paid the price at Christmas. In the last quarter of 2004, Sony's television sales rose 5 percent, but profits plunged 75 percent, year over year. No longer able to command the premium prices associated with proprietary technology, Sony increasingly competes with high-volume, low-cost producers. "I meet many Sony employees here who are so gloomy," Takeshi Oyabu, an assistant professor of Keio Business School, said in an interview here. "Without me saying anything, they say things like 'I am from Sony whose reputation is very bad.' "
In the United States, however, Sony's brand reputation is far stronger with consumers than it is in Japan or most of the rest of the world. "My product may be better today in a blind test but consumers love S-O-N-Y branded on their TV's," Mr. Sanduski said. Sony followed its flat-screen joint venture in December by signing a cross-licensing agreement with Samsung. Valid until 2008, this deal allows the two companies to share the roughly 20,000 patents they hold between them. In cellphones, Samsung's clamshell designs, clear displays and strong computing power have emboldened the company to set a worldwide 2005 sales goal of 100 million handsets, 16 percent more than last year's sales. Such an increase in sales could pull Samsung close to the industry's second-largest cellphone producer, Motorola, an American company that sold 104.1 million handsets last year. 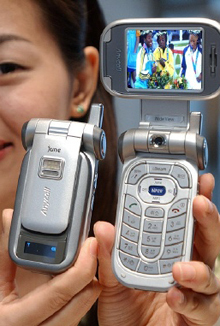 While cellphones are Samsung's largest business, Sony has stayed out of mobile phones. But in a time of technology convergence, Sony could lose if increasingly powerful cellphone cameras start cutting into sales of digital cameras. In Korea, Samsung unveiled on Wednesday the world's first mobile phone with a powerful 7-megapixel camera. By comparison, many digital cameras feature 3 or 4 megapixels. In an example of technological convergence, this high-end handset, SCH-V770, is Internet-capable and has an MP3 player and a business card reader. "The transistor radio, Walkman, Trinitron tube televisions - Sony created products that changed our lifestyle," Mainichi Shimbun newspaper said in an editorial Tuesday. "We hope to see the introduction of new, Sony-like products as soon as possible." On Tuesday, Sir Howard met with Japanese reporters and vowed that Sony would be cool again. But on the Ginza, Japan's main shopping street, cool migrated a few months ago from the Sony's showcase building to the five-floor Apple Computer store. On a recent Sunday afternoon, crowds elbowed each other to inspect the latest iPod designs, using computer terminals to book appointments with Apple's sought-after technical advisers. When Sony was caught flat-footed with a late introduction of an Internet version of its 25-year-old Walkman, its profits from world audio sales fell a cataclysmic 48 percent in the final quarter of last year. Once again, Sony had coasted on an old technology, while competitors invested in new ones. "Samsung is like the old Sony," said Mr. Gilder, who edits the Gilder Technology Report. "Samsung has much of the spirit of Sony 10 years ago." James Brooke reported from Tokyo for this article and Saul Hansell from New York. The above article is from NYT.